Growing up in Florida, I often crave relaxing on a warm beach with a cold drink in hand. That’s nowhere to be found in San Francisco (the beaches are cold), but our recent trip to San Diego hit the spot. The big question was where to eat in San Diego. We found some of the best fish tacos, a natural wine shop, an old-school Italian grocery with delicious sandwiches, freshly cracked sea urchins on the pier served with poke, and one of the most glamorous steakhouses we’ve been to in a long time. We headed down to San Diego for a long weekend getaway with Alaska Airlines. Just a quick flight from San Francisco, it made such a difference to be in the warm sun. We stayed at Hotel del Coronado, a historic island resort. Several movies were filmed here and some of its famous guests include Marilyn Monroe, Franklin D. Roosevelt, Walt Disney, and Rudolph Valentino. It was one of the inspirations for Disney’s Grand Floridian hotel, with its large white buildings and iconic red roof located directly on the beach. One of our favorite features of the beach is the tidepools you can explore during sunset each day. We wanted to relax on our first night before we explored downtown San Diego, so we had dinner our at 1500 Ocean (which is now temporarily closed), the hotel’s fine dining restaurant. It was one of the highlights of our stay, second only to the relaxing beach cabanas we enjoyed on Sunday afternoon. We discovered that there aren’t a lot of other great dining options on Coronado Island. We decided to focus the rest of our time exploring downtown San Diego, just a short drive from the hotel, and picked up some tips from the local culinary industry insiders. San Diego has an amazing Little Italy. There are way too many places to try in a weekend, but we found a few specials gems, several of which are non-Italian restaurants. For a glamorous steakhouse experience or rooftop cocktails, this was one of our favorite restaurants in San Diego. It’s extremely busy so you’ll want to make a reservation. Be sure to order a cocktail from the bar upstairs or their martini cart! For a classic Italian sandwich, head to Mona Lisa. This shop reminds us of a deli you might find in Boston’s Little Italy. It’s also down the street from several good breweries, including Ballast Point. You could pick up sandwiches to take to the beach, or eat on their patio at lunch and watch the planes fly into San Diego airport (they get insanely close!). 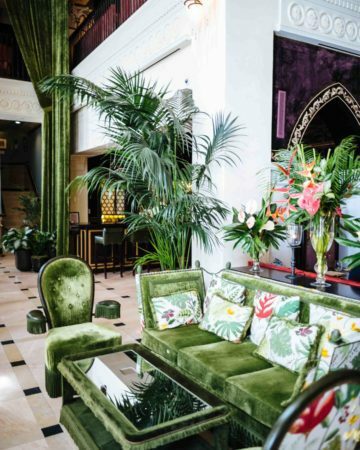 This is where you should go for cocktails or dinner. They have an innovative bar downstairs as well as an open patio upstairs. 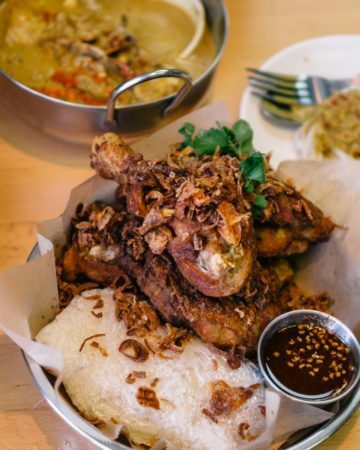 We recommend trying the Thai Roasted Pork Shoulder (seen above). If you go late at night, the open-air rooftop lounge with cabanas becomes a club scene. 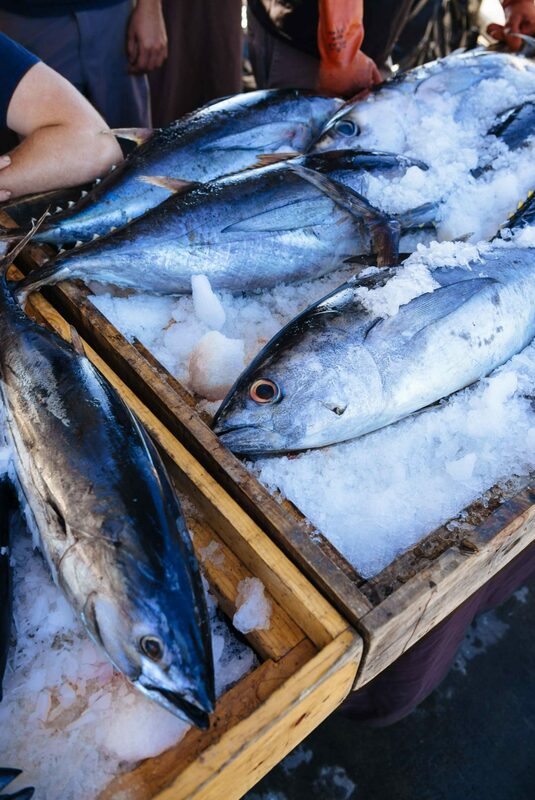 If you love fish and seafood, you can’t miss this Saturday morning fish market. Run by fisherman, you can get amazing fresh local seafood to eat on the dock for lunch, and the freshest fish to bring home to cook. This was our favorite experience in San Diego. It’s not to be missed! See more from our market visit here. Head to Ocean Beach for some of the best tacos at Mike’s Taco Club. The place is divey, but the food is incredible and a little messy. Our absolute favorite is the octopus tacos. Trust us. Get a Cali burrito to go and sit on the sea wall watching the surfers. Tacos are a little harder to travel with. For the best fish tacos, we recommend Pacific Beach Fish Shop. Get an order of tacos, onion rings, and a beer and sit on the patio. Unfortunately, it isn’t on the beach, but you won’t want to miss those huge beer battered onion rings. It’s worth it. If you’re into beer, head to the Ballast Point brewery. Try a flight or choose from a long list of beers you can only get at the brewery. Sit on the patio and watch the planes, which fly directly over the enclosed patio. For a great selection of small, family-run producers and natural wines, you’ll want to stop into Vino Carta. You’ll find everything from California to Italian and French. Get a bottle or order wine by the glass. Some of the wines we loved seeing include Dirty & Rowdy, Matthiasson, and even Cappellano Chinato. Other places we didn’t get to on this trip but are on our list include Ironside for seafood, Polite Provisions and Raised by Wolves for cocktails, and Tacos al Gordo for local tacos.